There are two places where the bicep muscle connects: the shoulder and the elbow. In your shoulder, tendons connect your bicep into the shoulder joint. In your elbow, tendons keep the muscle attached to your lower arm. We most often see bicep injuries at the connection point with your shoulder. Strains or tears can develop in the ligaments. The tendons can also slip out of the groove at the top of the humerus — the bone of the upper arm — that holds the muscle in place. We sometimes see injuries to the bicep tendons at the elbow, but these are more rare. These conditions result in bicep tendonitis, which is a strain or tear in the tendons that can cause a great deal of pain. 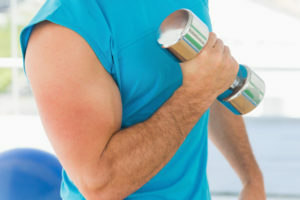 You may envision a bicep injury resulting from a single incident, like lifting a particularly heavy dumbbell or struggling with heavy furniture. But most of the time, bicep injuries in adults are overuse injuries and they are more common as we age. They could result from repeated lifting required for your job, picking up young children or even playing your weekly round of golf. Since these kinds of injuries usually develop slowly over time, they are hard to prevent. Be sure to listen to your body when an activity is causing pain that goes beyond temporary muscle soreness. Bicep injuries can cause you pain, but they don’t require an immediate visit to your doctor. Rest: Take a break from the activity that’s causing pain or soreness. Ice: Apply ice packs to the affected area to reduce pain and minimize swelling. Elevation: Sit propped up instead of lying flat. Keep your injured joint above the level of your heart. I advise patients to avoid compression because it can be difficult to wrap the shoulder and if you wrap the elbow incorrectly, it can result in hand swelling. If you’re still experiencing pain after a few weeks of these at-home treatments, it’s time to call your doctor. It’s rare that bicep tendonitis causes any long-term damage, and surgery is usually not required. Your doctor may recommend physical therapy as part of your treatment. Often the hardest part of recovering from any joint or tendon injury is to fully rest the area. If you dive back too soon into the activity that’s causing your pain, you’ll slow your recovery and increase your chances of re-injury.